Fly to the Antarctic, marvel at towering icebergs and stunning fjords, enjoy the antics of the prolific wildlife and, weather permitting, cross the remote Antarctic Circle. Take the Polar Circle Air-Cruise to King George Island and begin your voyage past breaching whales, seals and an incredible richness of bird life. Plus a parade of jaw-droppingly beautiful scenery. And then, weather permitting, the highlight of the cruise; celebrating the crossing of latitude 66° 33’ S – the Antarctic Circle itself. NB: all cruises offer a variety of excursions that may vary with weather conditions. *Please enquire for more information on 2017/2018 expeditions. Price representative of 10 nights on board the Vavilov, excluding economy class flights & airport taxes. Arrive at Punta Arenas for reception and briefing. Fly to King George Island for embarkation via Zodiacs. 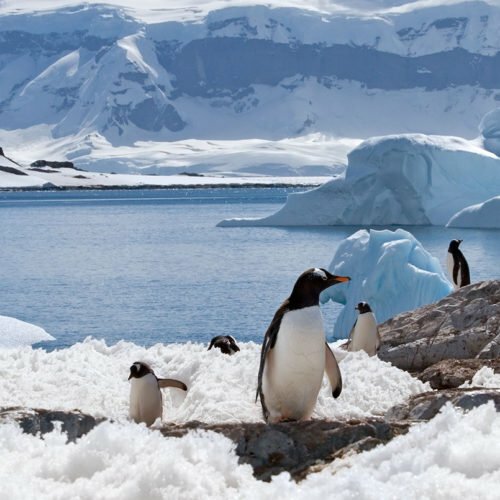 Sail from the South Shetland Islands to the Antarctic Peninsula, visiting Ciera Cove, Port Lockroy, Petermann island, Paradise Bay and the Lemaire Channel – amongst others, before making your assault on the Antarctic Circle. Cruise back to the King George Island for disembarkation and return flights to Punta Arenas.